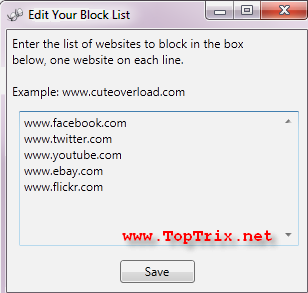 Do you want to block some unwanted websites that distracts you from your targeted work? Or do you want block social networking sites like Facebook and Twitter from your family members, your children? Or whatever the scenario you want to block any particular website or group of predefined websites. A simple lite utility will allow you do the same as you want do. FocalFilter is a program that will allow you to block the predefined website for any time you set. You just have to enter the website address and the time for which you want to block that website. If you change your mind you just have to reboot your computer. The best thing is that this application works with all the popular browsers like Firefox, Chrome, Opera, Internet Explorer and Safari as it works at Windows Host level and not at browser level. It works with Windows XP, Vista and Windows 7. Your computer should have MS .Net framework 4.0 installed to run FocalFilter. You can download FocalFilter which is just 1.7MB. Chrome:: StayFocused is extension for Chrome that do the same as LeechBlock.